This post is for those who are searching on the internet for how to write Leave Letter to School Teacher for My Daughter. 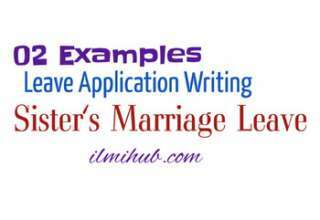 Here are 2 simple application examples and you can change the words as per your requirement. 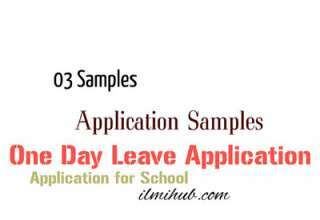 This application could be written to school teacher or principal. My Daughter, Zunera is a student of Class 6 (Section C) in your school. My cousin brother’s marriage ceremony is going to be held on 04.03.2018. We all are going to visit our native place to attend his marriage. So, she will be unable to attend the class from 02.03.2018 to 06.03.2018. Kindly grant her leave for 05 days only. Thank you in anticipation. You may also like Sick Leave Application by Father. My Daughter Shagufta is a student of Class 4 (section C) Roll No.23 in your school. She is unable to attend her class as she is down with Chicken-Pox. It is understood that this is a communicable disease. So, the doctor has adviced her complete bed rest for 5 days. Therefore, it is requested kindly grant her leave for 5 days from 23.05.2018 to 27.05.2018. Thanking you in advance. 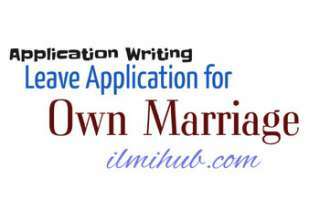 Application for Urgent Piece of Work Example is also available.